Tag line: " EVEN THOSE WHO LOVED HIM WERE NOT SAFE!" For the second day in a row, I’m sitting down with a Hammer horror film, only this time my choice of movie had more to do with its star than the studio that produced it. 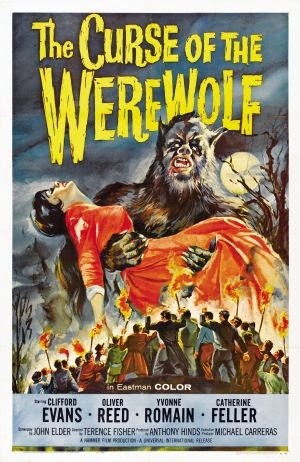 Directed by Terence Fisher, 1961’s The Curse of the Werewolf is the story of Leon (played as an adult by Oliver Reed), a Spaniard whose mute mother (Yvonne Romain) died after giving birth to him on Christmas Day. He’s taken in by the kindly Don Alfredo Corledo (Clifford Evans) and his wife Teresa (Hira Talfrey), but as Leon grows, he displays an unusual thirst for animal’s blood, an urge that, thanks to the love and patience of his adopted parents, he eventually learns to control. Once he’s an adult, Leon sets out to find a job, and ends up working at a vineyard owned by Don Fernando Gomez (Ewen Solon). Over time, Leon falls in love with Don Gomez’s daughter, Cristina (Catherine Feller), who is already engaged. Yet as his feelings for Cristina grow, Leon slowly succumbs to his animalistic nature, and must face the unhappy truth that he is, and probably always has been, a werewolf. Leon’s tragic tale is a fascinating one, but in reality, only a portion of the film is dedicated to his story. The entire first half of The Curse of the Werewolf takes us back in time to reveal its main character’s lineage: Leon's actual father, a beggar (Richard Wordsworth), was thrown in jail by a corrupt Marquis (Anthony Dawson), and, after many years behind bars, raped the jailer’s daughter (the mute girl who would become Leon’s mother). Performance-wise, these opening moments are strong: Wordsworth does a fine job as the naïve beggar, yet the strongest character early on is the villainous Marquis, a loathsome man who ridicules the Beggar, then, on a whim, tosses him in prison and forgets about him. Despite the fact it doesn’t feature a single werewolf, the opening of The Curse of the Werewolf does manage to flesh out Leon’s family history, revealing the unfortunate set of circumstances that contributed to his “condition”. What drew me to The Curse of the Werewolf, though, was Oliver Reed, in what would prove to be his first starring role in a major film. Having impressed me with his performances in such movies as Oliver! and The Brood, I was anxious to see how he’d portray a werewolf, and I’m happy to report that I wasn’t disappointed; aside from the role’s physical demands (which the actor handles with ease), Reed successfully conveys the inner turmoil his character experiences after learning the truth about himself (the scenes immediately following his first adult “transformation”, during which he kills several people, are particularly grueling, with Leon, a normally docile man, forced to confront his violent nature). With its stunning period set pieces and overall dark tone, The Curse of the Werewolf is unmistakably a Hammer film, but in the end, it’s the lead actor who makes it unforgettable.